The original fan controller switch used by Jaguar, and a host of other manufacturers in the 1960’s and 70’s, was known as an Otter Switch. In its day this unit functioned adequately but technology has moved on and more reliable, solid state alternatives now exist. However, fitting a modern switch to a car originally equipped with an Otter Switch is not always straight forward because of the way the Otter Switch mounts into the cooling system. In response to the need for more reliable fan control, Fosseway Performance has developed this simple kit which allows the original Otter Switch to be replaced with a modern switch. The new switch can be installed without the need to cut water pipes or modify the cooling system in any way. 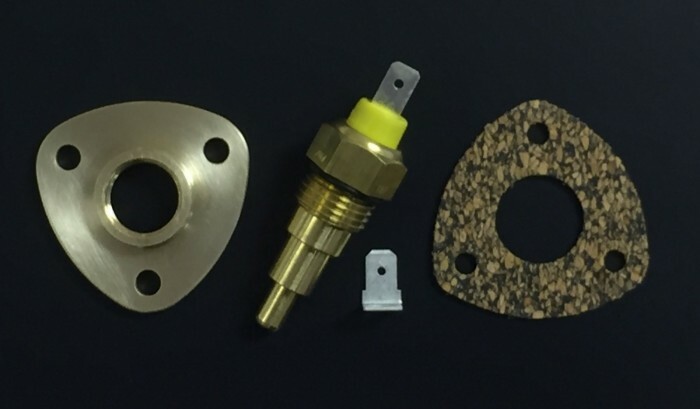 The comprehensive kit includes a modern solid state switch, cork gasket, earth terminal and brass adapter plate. The Fosseway Performance fan switch kit is suitable for negative and positive earth vehicle and is ideal for use with our Series 1 E-type fan kit. Please note that the switch kit must be used with a relay. If your current fan installation does not include one we will be happy to supply a suitable unit.